In the School of Music and Performing Arts, we are so proud of our students and alumni and their work as professional musicians. As students, they've been able to take advantage of academic and performance opportunities that have created a strong foundation for their professional endeavors. As alumni, they've forged their own paths and established careers doing what they love: sharing their musical talents through composing, playing, and performing. Alex Hollerman graduated with her Bachelor's degree in Vocal Performance from UL Lafayette in 2012. She went on to earn a master's degree at LSU, where she had leading roles in several opera productions, including Dorabella in Cosi fan tutte and Clothild Lombaste in The New Moon. As part of the Promising Artists of the 21st Century she performed the role of Dinah from Trouble in Tahiti with the Orquesta Sinfónica de Heredia. She has since moved to Seattle, where she did an internship with Seattle Opera. 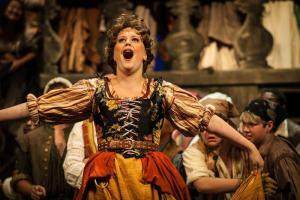 Most recently, she has performed in two productions with the Tacoma Opera Chorus: Don Giovanni and Die Fledermaus. She has also reprised the role of Mercedes in Opera Bend's production of Carmen. UL Lafayette was just what I needed when I was a still-wet-behind-the-ears 18 year old. Looking back now I would have never guessed I would wind up where I currently am. When I first walked through the doors I wanted to be a choir director and work with children and now, 7 years later, I'm an aspiring opera singer who is still wet behind the ears. All I knew when I entered UL Lafayette was that I had this unquestionable love for music. I didn't know how to hone it or how to creatively channel it. I remember, it seemed like every day I would walk into one my classes and leave with a deeper appreciation of music and also a better understanding of it. I met some of my best friends and some of the best mentors at UL Lafayette. They were exactly what I needed to grow into the person I am today. Though I'm not an illustrious and world renowned singer…yet, I have so much gratitude for my humble beginnings at UL Lafayette. It's the place where I learned that I have the potential to be this crazy thing called a performer. "UL Lafayette holds a special place in my heart. The four years I spent under the instruction/direction of Mr. Shawn Roy were the most fun and important years of my life. He taught me how to be a driven singer, a good colleague, and most of all, a professional. I owe so much success to UL Lafayette and particularly, Mr. Roy. He challenged me on every level and to this day, is a great support. You need much more than talent in this business and because of what I was taught at UL Lafayette, I am a successful, confident, and dependable performer with a solid reputation. I highly recommend UL Lafayette to any and everyone. After getting my bachelor's in music from the University of Louisiana at Lafayette, I went on to graduate school. It was such an honor to receive both choir and voice scholarships from such a competitive school. (Thanks to UL Lafayette for preparing me!) My debut role in graduate school was Julie in Romberg and Hammerstein's 'The New Moon.' The next semester, I sang Flora in Britten's 'Turn of the Screw.' The summer of 2013, I traveled to San Francisco to sing more Britten as Tytania in 'A Midsummer Night's Dream.' Then I moved on to one of my favorite roles to date: Anna I in Weill's 'Die Sieben Todsünden.' My last role in graduate school was Valencienne in Lehar's 'The Merry Widow.' Then, it was time to graduate, which is always so bittersweet. The following summer, I had the immense honor of singing at the Castleton Festival under the musical direction of the late Maestro Lorin Maazel. He composed an opera called '1984' and I was cast as the Gym Instructress. Only one other soprano, the amazing Diana Damrau, has ever sung it. Because, coincidentally, not only must you be a coloratura but you also must be a gymnast that can still do a split....and still sustain tone at the same time! After the Castleton Festival, I sang my first professional role with Opéra Louisiane as Spirit One in Mozart's 'The Magic Flute.' Shortly after that, I was cast in my first film as Ligeia based on Edgar Allen Poe's short story entitled 'Ligeia.' We will film in March and I am eager to sing and act in my very first movie! On a different note, I am also a co-founder of a brand new chapter of Opera on Tap in Lafayette. I am looking forward to creating opportunities, not only for myself, but for other singers as well! At the moment, most of my time is spent working on my second graduate degree in communicative disorders. I fully intend on becoming a singing voice specialist to rehabilitate all types of singers! Austin, Texas, has a great music and art scene, so maybe I'll start my next adventure there as a singing voice specialist and performing soprano(/movie star)!" 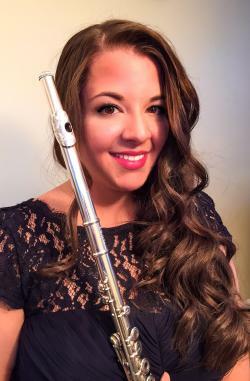 Julie Sabo completed a Masters in Flute Performance in 2014 and is currently pursuing a Doctor of Musical Arts degree with a full teaching assistantship at Shenandoah Conservatory in the flute studio of Jonathan Snowden. If you are considering attending the University of Louisiana at Lafayette, take a chance and apply! Moving across the country to Lafayette wasn't in my original education plan, but I am so thankful that I chose to attend UL. I feel that I was given an abundance of individual attention and a personalized education. The close personal and professional relationships I developed with my professors and intense private study provided me the skill and confidence to successfully audition for the most rigorous doctoral programs offered for my instrument. The Graduate Assistantship program was a gift beyond measure and funded the entirety of my graduate degree and allowed me to begin my teaching career at the university level. This experience was undoubtedly what set me apart from other candidates in my auditions for doctoral school and consideration for a teaching assistantship. Andrew Smith graduated with his bachelor's degree in music media and composition in 2010 and is now a professional film score composer. He's a veteran composer who's scored more than 20 feature film and television projects, including "Storm War," "The Culling," "Alien Rising," and "Jack the Giant Killer." In the last five years, he's scored more than 45 projects across all media. He also worked with and provided additional music for Nathan Furst, the composer for "Act of Valor," "Need for Speed," and "Waiting for Lightning." "Attending UL was a very formative time for me. The professors were very supportive and encouraging in my passion for film scoring. They helped me by whatever means they could offer. The program helped me grow at the pace I needed." 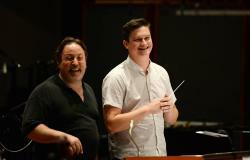 Image right: Andrew Smith during the BMI conducting workshop in LA in August 2015 with the teacher Lucas Richman on the left. Taken on the Warner Bros. Eastwood Scoring Stage. Photo by Annamaria Disanto. 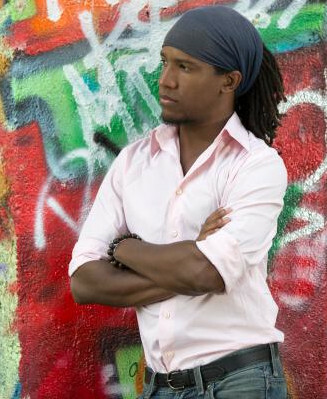 Bradley Broomfield graduated in 2008 with his bachelor's degree in music performance. He's currently the Principal Timpanist/Percussionist of the Jordanian National Orchestra and Instructor of Percussion at the National Music Conservatory in Amman, Jordan. Previously, Brad toured internationally as Featured Percussionist/Snare Drum Soloist with the Tony- and Emmy-Award-winning Broadway show, "Blast!" and is a former member of the Acadiana Symphony Orchestra. "At UL Lafayette, I loved that I was able to learn about so many amazing music traditions, from dedicated teachers, while being surrounded by the beautiful culture of Cajun Country!" The Master of Music in Theory and Composition with an emphasis in theory is a rigorous program that provided me with the exposure necessary to successfully begin my doctoral studies in music theory. The required coursework allowed me the opportunity to engage with topics, such as the history of music theory, that are pillars in any doctoral program in the field. By first experiencing topics such as this in the Master's program I was able to build upon my previous knowledge and further my understanding of such important ideas. The program also provided me with the flexibility to pursue my own research that led to my thesis and my forthcoming dissertation. By having such a clear research focus and a solid foundation of work to build upon I entered my doctoral studies without any of the anxiety that comes with defining my research focus. The faculty and resources at the School of Music also provided crucial personal and professional support throughout my time there. Aaron Boquet completed a Master of Music in Flute Performance in 2015. Studying at ULL's School of Music gave me the tools and opportunities I needed to build my musicianship as a flutist and scholar. I was able to perform in high quality ensembles, which gave me the experience of performing some great literature under some well-established batons. I learned how to be a leader—sitting principal chair in the top ensembles, teaching as a graduate assistant, or simply having the undergraduates look up to me as a model student. The school of music has a great sense of community. I was really comfortable to be myself and express my opinions in a personal and academic manner. This helped me build security in my musical expression and drive to learn more. On a personal level, Dr. Loewy was an extraordinary mentor. She is very caring of her students and pushed me to succeed with a calm and uplifting attitude towards music. Under her, I acquired a great number of practice tools to use and share with my new fellow colleagues and students. Tessa Espinosa received a BA in Vocal Music Education in 2013. She went on to earn her MM in voice performance from the University of Northern Colorado in 2015 and was accepted into the doctoral program there in voice performance. She sang several leading roles with the Ft. Collins Opera and spent the last two summers touring in Europe with the Opera Classica Europa. This past summer she made her solo debut in Limberger, Germany to written critical acclaim. She was also accepted at the Mannes School of Music in NYC for her MM. She currently resides in Greeley, Colorado, where she sings major roles with the Ft. Collins opera and teaches voice and piano. Roldon Brown completed a BM in Flute Performance in 2008 and is currently the Principal Flutist of the Jordanian National Orchestra. He has performed concerti and solo recitals throughout Europe, Scandinavia, and the United States. He is currently the Instructor of Flute at the National Music Conservatory of Jordan. He is sponsored by the International Stuttering Foundation, and plays on a Haynes headjoint, which is sponsored by The Haynes Flute Company of Boston. "The curriculum is only the beginning. Not only was I taught music, but I was taught how to problem solve with creativity, how to stand up for my ideas, and how to think outside the box. When any obstacle arises, I think back to the lessons from my ULL days, and I quickly remember, that everything I need…is already in me!" 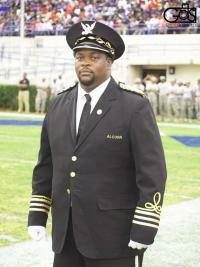 Everson Martin earned a Masters in Music Education in 2011 and is now an Instructor of Music and Assistant Band Director at Alcorn State University. 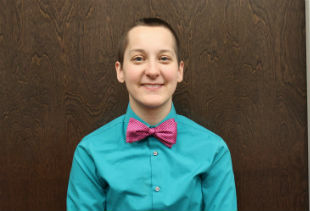 Virginia Hesse was accepted for graduate school in voice performance at Indiana University, Mont Clair University and the University of Houston. 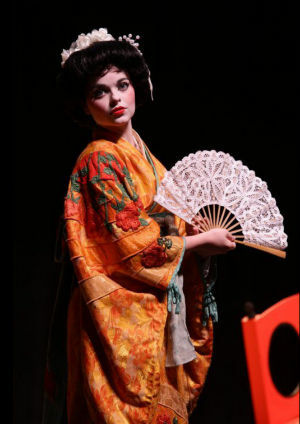 She is attending U of H and in her first semester was cast as a leading soprano in Puccini's La Rondine and the new production of Anna Karenina. She was selected by international audition as one of 16 young artists to participate in the summer 2015 opera program at the famous Seagle Colony in New York. The previous summer (2014) she was selected to participate in the prestigious AIMS program in Graz, Austria. "The diligence and encouragement of my instructors at the University of Louisiana made all the difference in my preparation for a post graduate program in Vocal Performance. Outstanding professors, such as Margaret Daniel and Shawn Roy, see to it that you graduate amply prepared for the next step. I owe all of my musicianship and training to these fine teachers. If music is your passion, seek out the quality teaching of our professors at UL!" Steve Kerin earned the Bachelor and Master of Music in Piano Performance degree from UL Lafayette, completing his studies in 1998. He lives in Portland, Oregon where he has developed a solid reputation as a session and side player, and is a three-time recipient of the Cascade Blues Association's "Muddy" award for keyboardist of the year. Although trained at UL Lafayette as a classical pianist, Steve now specializes in Blues and New Orleans styles. You can hear his music on iTunes. Andrew Sigler earned the Bachelor of Music in Theory/Composition (1995) and the Master of Music degree in Guitar Performance (1998) from UL Lafayette (then USL), completing his studies here in 1998. A prizewinning composer, he is Lecturer of Composition at the University of Tennessee, Knoxville where he directs the composition program and teaches audio recording, theory, and orchestration. His work in the commercial field includes studio work as a guitarist and vocalist as well as composition and sound design for video games, advertising, and animation for a number of clients including Microsoft, Google, and T-Mobile. Mariella Fiordaliso earned a Bachelor of Music in Piano Performance in 1997. She lives in Toulouse, France where she performs chamber music throughout Europe. She also works as a collaborative pianist and as a teacher. ULL represents the place where my second life started. It was 1996 when I left Italy to come to ULL (at the time, USL). It seemed to me a dream, a dream come true! I feel particularly blessed because I had the chance to win a scholarship at the Ibla Piano Competition in Italy to study with Drs. Susanna Garcia and William Chapman Nyaho. These two marvelous pianists and pedagogues helped me to acquire a deeper consciousness about playing the piano and more confidence in myself. I had many opportunities to perform on stage, as a soloist or with other musicians. I think that giving music students the opportunity to play in public is a very important factor for their musical growth, as it was for me. Other activities such as accompanying the University choir and my piano pedagogy classes enriched my musical experience. I was very proud to obtain the Bachelor of Music in 1997, and I feel thankful towards my teachers and all the Faculty of the ULL School of Music who supported me. There is one more reason why I care about ULL…it is the "fairytale" place where I met my life companion and husband, a French student, Ivan, isn't that great? Jeremy Coleman, MM, MT-BC completed his undergraduate studies at UL Lafayette in 2006 with a BM in classical guitar performance under the tutelage of Dr. Jeffrey George. After graduation Jeremy went on to receive his certification in music therapy at Sam Houston State University and Masters degree in Music and Human Learning at The University of Texas at Austin. 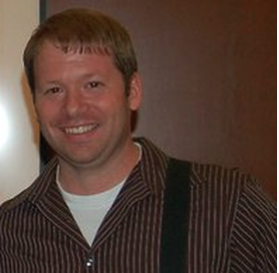 Jeremy began his work as a music therapist in Austin. He started a private practice that allowed him to work in several different healthcare, education and home settings. In 2011, Jeremy collaborated with the largest classical guitar organization in the country, Austin Classical Guitar, utilizing their classroom guitar curriculum to teach students at the Texas School for the Blind and Visually Impaired. Jeremy is currently a full-time music educator and guitar teacher for students with visual impairments.